A biographical drama, Stronger explores post traumatic stress disorder through the lens of a Boston Marathon bombing survivor. Boston, April 2013. Avid Red Sox fan Jeff Bauman (Jake Gyllenhaal) works at Costco and is in an off-again, on-again relationship with his girlfriend Erin (Tatiana Maslany), an enthusiastic runner. Although they are currently having a tiff, he decides to support her by showing up at the finish line of the Boston Marathon. Twin terrorist explosions strike the event right near where Jeff is standing; he survives, but both his legs are amputated above the knee. The post-bombing photo of Jeff being rushed to an ambulance is flashed worldwide. When he wakes up in hospital Jeff recalls spotting one of the bombers, and his description helps the FBI. His rough and tumble working class family rallies around him, including his mother Patty (Miranda Richardson), and he becomes a reluctant symbol of heroism representing "Boston Strong". But Jeff is irritable, suffering from PTSD, has flashbacks about the bombing, and wants to be left alone to recover. Directed by David Gordon Green and based on Bauman's book, Stronger portrays the often harrowing experiences of a victim and survivor, well after the international headlines of terrorism fade away. After the world gasps with revulsion, counts the victims, and moves on, the injured and their families are left behind to pick up the pieces and reassemble a semblance of a life, and Stronger is their story. There is nothing special about Jeff Bauman, and this is the point. An ordinary blue collar guy, the last thing he strives for is to be labelled a hero and designated a symbol. Before the bombing Jeff regularly disappointed Erin with his lack of responsibility and care for their relationship. Now the entire city wants to anoint him as a poster child for Boston Strong. Suffering from the trauma of losing his legs, the shock of the explosions and incessant family pressure, he naturally cracks. Erin does what she can (and more) to stand by her man, by even she can only take so much. Jeff has to go back to who he really is before he can face what he may represent, and the film respects the slow process of physical and emotional healing. 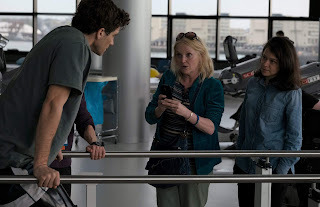 Jake Gyllenhaal disappears into the skin of Jeff Bauman and delivers a performance of hollow and dark eyes, the imperative of determination clashing with the reality of despair. Tatiana Maslany is a revelation as Erin, as she also portrays a real rather than angelic person: Erin has her needs and aspirations, and both Jeff and especially his mother Patty regularly breach her boundaries. Stronger stays within itself and limits its ambition to a small, intimate and often painful focus on one individual. This is not a film trying to change the world, just a film about one man's world after it has been changed forever.